POC Connectivity for Enterprise Organizations. Drive results across your enterprise organization. Without the correct systems in place, managing a healthcare enterprise organization can quickly get away from staff — particularly point-of-care (POC) coordinators. Through this increasingly prominent demographic of acquisition and expansion, there is a great need for POC connectivity in order to standardize workflows and quality of care across multiple geographic locations and care sites. Without connectivity, POC coordinators must dash between locations in order to manage POC testing (commonly referred to as the ‘sneakernet’) with practices spread far and wide across their service area. There’s a need for operational visibility in order to ensure CLIA compliance. The regulation doesn’t care whether you’ve actually set foot in a location — quality control (QC) logs and test results must be complete and accurate throughout the enterprise. Without connectivity, this kind of visibility — and ease of data retrieval — is hard to come by. Many enterprise organizations look to a laboratory information system (LIS), from LabDaq or Orchardsoft, in order to manage POC testing as they hope that by investing in lab interfaces, they can reduce administrative burden and increase workflow efficiencies. Alternatively, they look to acute care connectivity solutions from Telcor or RALS and try to force-fit them in a primary care environment. However, these are misguided routes to take, involving a great deal of expense, an up-front commitment, and no flexibility. Enterprise organizations need a solution that is easy to implement, use and scale up while keeping data secure and compliant. As Relaymed was built with these features in mind, it is the POC connectivity tool for enterprise organizations. We built Relaymed with scalability in mind. You can start at a single location and simply rollout from there as you acquire new locations or wish to reap the benefits at existing locations. It’s straightforward and cost-effective, with no ceiling to the number of locations or devices you connect. An LIS, on the other hand, would be logistically and financially demanding — a key reason that they are unsuitable for the expansion potential of an enterprise. Again, unlike an LIS, you don’t have to immediately commit to implementing Relaymed throughout your organization. You can pilot the software at a single location and then rollout across your entire organization once you are satisfied with the ROI and the ease with which you can coordinate POC activities. Relaymed’s EHR lab interface can also be set up in your test EHR environment first before being deployed to production. 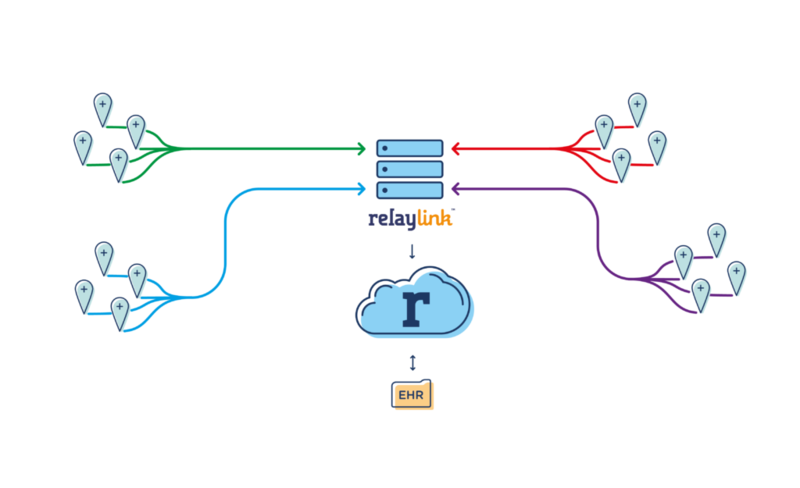 The Relaylink is a single installation on a server that allows for ease of scalability. You can network hundreds of locations and thousands of devices to it just through a single installation, allowing Relaymed to scale easily as your enterprise grows. Plus, due to our agnostic approach, there’s no need to worry about introducing different devices into your POC workflow when a new location is acquired. We are vendor neutral, meaning that we can work with any device manufacturer across your enterprise, at no additional cost. We understand that the IT resource in most healthcare enterprises are occupied with an incredibly busy work schedule — they don’t need more line items. Therefore, we designed Relaymed to be lightweight, streamlined and so easy to use that you’ll barely realize that you’re using it. This starts with implementation — it could hardly be more straightforward. Choose a device and we can have a connection up and running in 5 days, or less. This simplicity extends to the use of Relaymed, in that there’s really not much that staff needs to know. Relaymed is an invisible middleware, designed to give staff less to do — not more. As a result, training is minimal, to the tune of a short introductory webinar with our onboarding specialists. And to make sure what IT resource you do have needn’t worry, there is no requirement for costly and burdensome server maintenance once you are up and running. Unlike an LIS, Relaymed is cloud-based — there are no servers to maintain. We consider data security to be our number one priority and have taken every possible measure to ensure it is adhered to, with policy and technical controls. Relaymed is HIPAA compliant and HITRUST CSF assured. All data held is encrypted, within our U.S. based Microsoft Azure environment. It integrates seamlessly with existing EHRs and POC devices—granting us certification with vendors such as athenahealth and Allscripts. We have worked with several enterprise organizations and haven’t experienced any problems with security and risk assessment procedures or approval. We aim to keep it that way. Read more on our commitment to security here. By ensuring Quality Controls (QC) are logged from devices and tracked, you are protected from the risk and cost of compliance with CLIA. Using Relaymed’s reporting features, you can check that a test is being performed and is working correctly, as well as tracking whether QC results are changing over time. As all test results are logged and accurate, you are protected from revenue loss in the face of payor audits and unbilled tests, as well as saving countless unproductive labor hours. These factors present a compelling ROI that no CFO can resist. By eradicating the tedious and time-consuming data entry that comes along with logging POC results, you can also ensure that patient care and staff satisfaction are improved. Providers and medical staff will spend more time with patients and less time apologizing for hold-ups relating to POC testing. This also allows you to increase throughput. Use our handy ROI calculator to see how much you could be saving. So, there you have it — compelling cases to present to all stakeholders on why Relaymed is the solution for enterprise organizations. No more stressing about how you’re going to coordinate POC testing in yet another location. No more running around to check on QC logs and test data. No more unproductive labor hours spent by staff across your locations. No more revenue leakage. Just POC connectivity and total operational visibility. See all the benefits Relaymed brings here. What’s more, each benefit that you unlock grows exponentially with each physician office you add to your enterprise, making it the perfect choice in these organizations. Schedule a 1:1 demo and discover just how easily your organization can automate POC and benefit financially. From there, we can book staff into a short training webinar. You’ll be ready to go in no time! No problem. Get a 1:1 call with a Relaymed consultant today.